"My grandfather cheated my father when he gave him cows and wives but didn't send him to school. And my father cheated me. He gave me cows and bought wives for me, but wouldn't send me to school. I wont cheat my children that way. Please, won't you open a school for my children?" Because of these words, and with Bature's advocacy, three schools for Fulani children were quickly established in what is known as the 'middle belt' of Nigeria, with a fourth in Enugu State, farther to the south. The first and largest of the schools, Bright Hope Christian Academy, is located in Emiworo Village. No wonder we love this town! Rev Jacob Ahiaba, beloved pastor and co-worker, saw this school, saw Jim and I, in a vision back in 1989, many years before we ever set foot in Nigeria. Located a short distance from Emiworo is the Ero Mountain Grazing Reserve, the first reserve in Nigeria to demonstrate and teach planned, rotational grazing. The reserve is divided into nine large paddocks, with cattle from several Fulani owners joined together and grazing rotationally, in the system established by our mentor, Zimbabwean Allan Savory. Allan actually visited our reserve back in 2014 after holding a three-day seminar in Abuja on this system of planned grazing. The seminar was attended by state governors, commissioners for agriculture, university professors and many, many Fulani chieftains. We were honored to host this world-renowned scientist and ecologist at our little reserve, this man who is restoring grasslands and water supplies in countries around the world! Anyway, we visited Kogi State this weekend to work on some faulty borehole pumps on Ero Mountain Reserve. There are three boreholes there, two pumps powered by a generator, and one solar pump. None of them had been working, meaning that the herds of cows and sheep had to trek quite a way to the river, morning and night, for their water. On Friday afternoon, we bought all the necessary supplies in Lokoja, the capital city of Kogi State, located just twenty minutes from Emiworo: pipe, fittings, electrical tape, cement, wire, petrol and more. Then all day Saturday and Sunday, the men labored to get at least two of the pumps up and running, and bringing out the life-giving water so desperately needed by our animals! And finally, they did succeed! The overhead tanks are filled, the drinking troughs as well. Hopefully the fix will last for a while now! 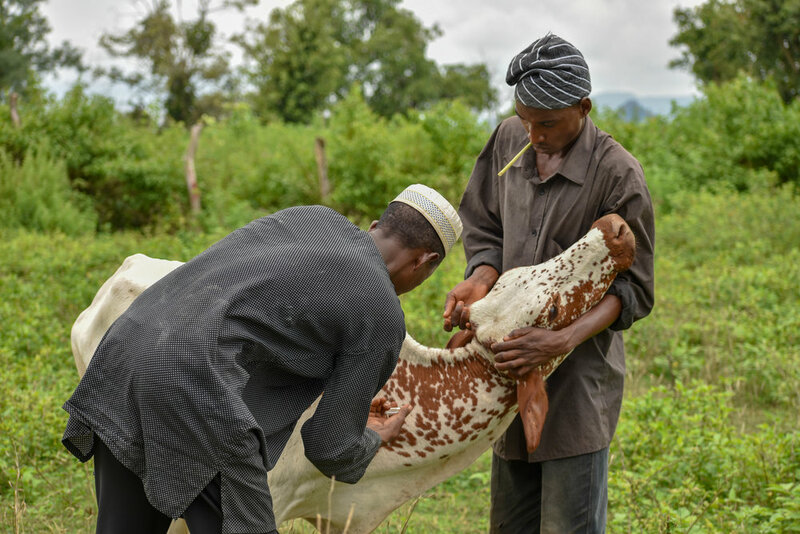 Besides fixing the pumps, we also bought vaccine for the cattle, and watched as the Fulani herdsmen tackled one animal after another, bringing them down and administering their injections! We bundled one large ram in to the back of the Sequoia to take back to Abuja with us and sell at the market. The ram isn't in very good health, but we can get a high price for him at this time of year when everyone is buying rams to celebrate the Muslim holiday, Eid-Al-Adha, when they remember God's provision of a ram for Abraham to sacrifice in Isaac's stead. On Saturday afternoon, when, realizing that the heavens were about to open and release great torrents of rain, Shane, Lawal, Siadu and I jumped into the Sequoia and slammed the doors. At that very moment, there was a deafening crash and explosion of light all around us! A lightning bolt hit the tree not twenty feet away from our car! The lightning burned through the bark and travelled down into the trunk right into the ground! This was the closest any of us had ever come to being struck by lightning, and was very scary! We sat in the car for several minutes, with heavy rain falling around us! Because school is still out for the summer, we didn't get to see many children or teachers at Bright Hope, or our good friend, Principal Roseline. One local Fulani boy did come and greet me though, telling me proudly that in September he would be starting junior high! I told him I'd be at his graduation, and he just beamed! We did also see Mustafa and spent time with Yahaya, both security guards at the school. Yahaya knows a bit about borehole pumps as he worked closely with Clement through the years. I miss Clement so much. Everything about Lokoja, Emiworo and Ero Mountain reminds me of Clement. He died a few months ago of liver disease, but will live on forever in our hearts. We were able to spend a little time with Rev Jacob and Janet in their Lokoja home. We didn't have time to meet properly with the three Fulani communities living on the reserve, but plan to do so on our way down south this coming week. These Fulani are farming on our grazing land, but we want to allow them to continue as long as their farms don't exceed their present boundaries, and as long as a portion of their harvest is donated to the feeding of the cattle! I spoke with one of these leaders about his cattle. He told me that his cows had been off the reserve during the dry season, but he was bringing them back now that the rains have come, and would join them to our herds for rotational grazing. This is very good! As we passed through the village of Emiworo this afternoon on our way back to Abuja, my heart was warmed at the sight of Bright Hope Christian Academy, it's grassy soccer fields, flamboyant trees, neat classroom buildings, and the hills beyond.